Legal action has been launched by a council to recoup £70,000 of money given to a football club and which it says should have been repaid. Shropshire Council said The New Saints FC received £80,000 six years ago "on the understanding it would be repaid", but only £10,000 has been recovered. The council admitted it "made mistakes" in tracing the repayments, but the club said the funds were not to be repaid. The New Saints, based in Oswestry, has been approached for comment. Its chairman, Mike Harris, has previously used Twitter to call for the council to apologise claiming the grant was not repayable, if its terms were met. Claire Porter, head of legal and democratic services at Shropshire Council, said: "We have commenced court proceedings, and we are therefore unable to make any further comment during the course of the litigation." 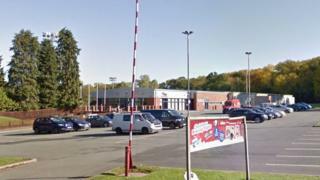 The money was used to pay for a 500-seat stand at the club, known as TNS, at its Park Hall Stadium, in Oswestry, so it could play European matches. The team currently plays in the Welsh Premier League. The council calls the money a legacy grant, and sees it as a loan. It says it came from the Market Town Revitalisation Programme (MTRP) - a fund of £3.5m made available to support economic growth in the county. According to an audit report by Shropshire Council, the first payment was made to TNS in June 2012. The document adds the only repayments by the club to date are £4,000 paid in July 2015 and a further £6,000 in November of that year. The report released by the council earlier this year said it was "unclear why the funds were not recovered earlier".